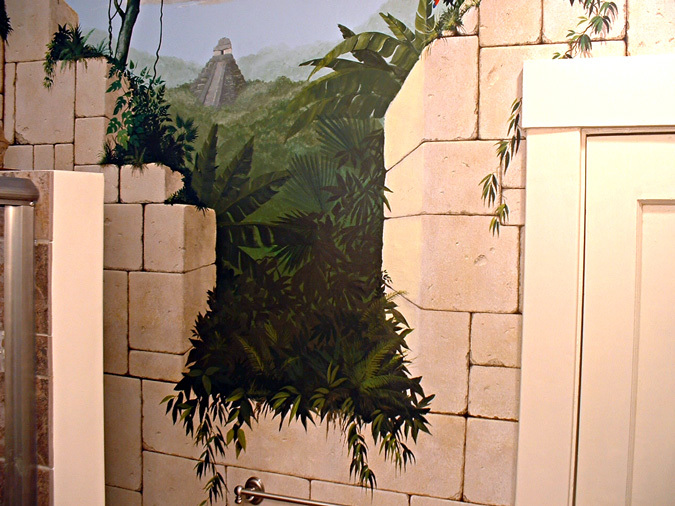 This mural was commissioned by a couple in San Francisco who were looking to showcase their collection of Pre-Colombian artifacts. We were working with a small bathroom, so part of the idea was to expand the space with the receding landscape. I based the temple and stonework on examples found at sites like Tikal (Guatemala); Chichen Itza, Uzmal, and Palanque (Mexico). The stones are painted with a special textured paint to give them the feel of actual stone.